The Seat: With everyone abuzz about Delta Airlines introduction of their version of premium economy that’s similar to KLM Economy Comfort service aboard long-haul flights, I thought it might be a good idea to check out their partner KLM’s version of this slightly “less annoying than coach” offering. What I ended up with was a very normal exit row seat with even more legroom than the others in this section. In regards to seat width, this is most certainly economy sans comfort as your tray table and personal TV eat up valuable side-body real estate. Keeping yourself entertained is easy with personal televisions at each seat, but the lack of in-seat power may keep you dependent upon KLM’s selection of movies and a couple of “30 Rock” re-runs that you’ve already seen on other flights. Service: Eh. Not fantastic. Food was delivered, drinks were served. No one complained. Notes: I noticed the gentleman in the row behind us had all 3 seats to himself. More than one of us attempted to steal his aisle seat but it turns out that he purchased the entire row. Not something you’re able to do on most airlines (to the best of my knowledge) but a brilliant move if you can. Summary: Each seat in economy comfort has up to 4 inches of additional legroom, and even more if you can grab 9B, 9C or 11D, 11E. The seats in these rows aren’t the best if you require extra width, but ideal for stretching out. The normal (non-exit) seats in this elevated economy offer a little of both and provide a good compromise. Strategy: Seats in economy comfort cost between 60 and 150 EUR. SkyTeam Elite Plus members (Delta Airlines Gold & up) receive 50% off. Members of the Flying Blue Program receive discounts as follows: Silver – 25%, Gold 50%, Platinum- Complimentary. How I got it: Purchased after reservation was made at KLM.com. The lavatory is far enough in front of these seats that it shouldn’t be a bother. 11 D & E appear to be a good choice in this “mini-cabin” if you don’t mind not having the window and wall to lean against for sleep. I think you’ll be pleased. Report back with anything I may have missed! Love your post! Im a platinum member KLM so can pick any seat in this section for free. I have never flown on the 747 combi though so im in need of some advice 🙂 . Im going for the extra legroom (so either 9 A,B,C or 11 D,E)… Which of these 5 seats can you recommend?? If I were to fly this one again, I think I’d choose 11D or E. Both have tons of legroom and there is a gap between the “E” seat and the wall for extra elbow space. If you end up in row 9, avoid the “A” (window) seat. As you can see in the video, the exit slide compartment really gets in the way of your feet and would most likely be pretty uncomfortable on a long flight. The combi is a pretty interesting setup. I like that Economy Comfort is in it’s own cabin here…Give it a more exclusive feeling. Good luck & Good flight! I’m looking desperately for any information about economy comfort seat, and finally faced your lovely post. Actually I book seat 9A at 747 combi since I definitely prefer the window seat, and wondering if it is a nice choice. Now, after reading your post, I decided to change it to 11E for extra+extra legroom and mini-aisle. Hi Pearl. Glad we could help. You pick up a LOT of legroom by moving to 11E. You’ll likely have to store your belongings in the overhead bin for takeoff and landing but you can use the “mini-aisle” to store things during flight. Looks like the best seat in this cabin to me. \ Have a great flight! Hi jake , I am planing to take a trip to Lax with this combi of KLM . Can you also give some idea about the economy class?? ?s there a entertainment system on economy and are the seats really 31′ far from each other in economy class? Can we survive till Lax with my wife 🙂 ? Hi Serkan. There are quite a few “caution” areas on this aircraft in the main cabin. On either side of the galley there will be a lot of light and noise from the galley. If you’re able to choose an exit row seat, you’ll have a lot of extra legroom EXCEPT by the window where emergency slide compartments will get in your way (see the video for an example). 31″ seat pitch (the distance between your seatback and the one in front of you) is pretty tight for trans-oceanic travel and may be a little uncomfortable especially if you’re near or above 6′. There IS personal video at every seat in economy so it should help pass the time. Hope that helps. Happy flying! Hello there, I found your answers helpful and really nice you took the time to help us! Question…I decided to upgrade to economy comfort and had to pay for it since I do not have the status yet. The only left thu was a window 14A. I took it but I am an aisle kind of person since I like to be free to stand up. I read somewhere that in economy comfort you can stand up without bothering much the rest of the row. Is it true? I hope so…thank you so much!!! Cristina- It’s certainly far less of a problem to crawl out from the window seat than in standard economy. That said, it’s still NOT so easy if your seatmates are stretched out and sleeping. I learned that the hard way recently in one of Delta’s Economy Comfort seats (which typically offer an extra inch or two of legroom). If you’re able- Check the seat situation a few days before your flight. High-level elites could decide to upgrade to business class or someone could cancel at the last minute…I can’t guarantee it will happen but it could open up a seat that might better suit your tastes. Best in this cabin are 11 D & E.
How much gap is there between the wall and E? I think I booked 16 E.. but I usually sleep against the wall–what could i bring to fill in the gap?? The gap between the seats and the wall on that side of Economy Comfort is substantial. If you want to lean against a wall to sleep, you’ll want to switch to a window “A” seat on the other side. Nice to read such an impartial and informative post. As a result I’ve just booked 11E for my upcoming flight from SFO to AMS. Great! Let us know how you like the seat & service. Enjoy the flight! Hi there, thanks for the video. 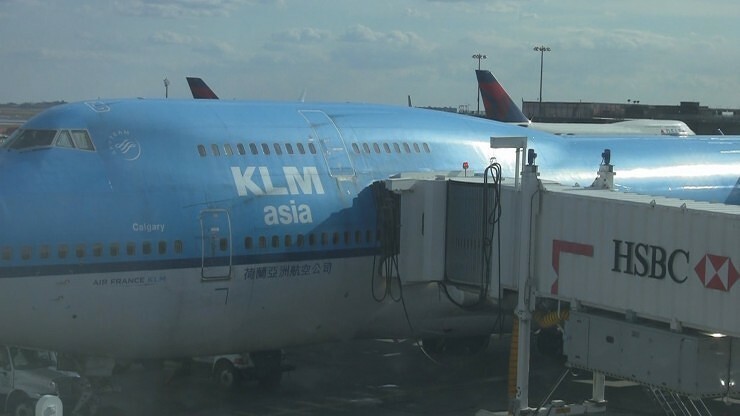 I will be flying this KLM 74M from Amsterdam to LAX next week. I am 6’2″ and this will be my first intercontinental flight. I love 747 and aviation and i always prefer window seats to watch outside, but i need legroom as well. Getting the window seat in exit row and extending feet to the top of the bulge would be awkward right? That door bulge takes legroom but putting my legs/feet over it could make it even more comfortable if it’s that low. Or else i am going to take 22 or 23A. Thanks for the review and the reply/advice, cheers. Hi ‘hashbury.2″ – I can’t confidently say that you’d be able to get your legs above the slide compartment (it’s pretty massive) and you might be scolded by the flight attendant for doing so. Even if you CAN get your legs up there, the compartment is slanted which might cause them to just slide right off. If you must have the window I’d take the seats behind it and keep from putting much underneath the seat in front of you so that you can stretch out. Otherwise you might consider the upgrade to Economy Comfort if available. Good luck and safe travels! thanks for the reply. i think i’ll get the seat or two seats below it. view is a must for me, something to lean while sleeping is also a must. but legroom is also essential for 6’2″ as you might guess. i am intending on doing walkarounds in the plane if i can find opportunities to get out of the row w/o making my neighbours grunt. exercise, circulation is important. only if i could take the jumpseat in the cockpit… what a view… and seeing the pilots in action would be awesome. Hi Jake, thanks for the concise and informative video and review. A quick question about that ‘A’ seat (slightly different from the ones before) – I have selected this seat in row 9 for a MEX – AMS flight next month, and was wondering if the slide actually *reduces* the legroom compared to a non-exit EC row, or is it just less when compared to the full stretch out available in the rest of row 9? As long as my legroom is at least that of the other EC rows behind, I’ll be happy.. Thank you in advance. Rob, Unless they’ve done something about it, you’d have to angle your legs around it to get full extension of both legs. You’d have to do some angling.